by Kerstin Sabene, photos by Kerstin Sabene and Mercedes Mejicanos. 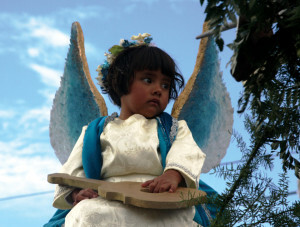 It was Sunday, Dec. 8 in La Antigua Guatemala, a magical day I would not soon forget. Friends and I had boarded a brightly colored chicken bus that was headed a few kilometers southwest along the Escuintla road to the neighboring town of Ciudad Vieja, literally Old City. I have had wonderful experiences riding on chicken buses in Guatemala before but today seemed especially remarkable. The atmosphere was festive and friendly and many of the locals were dressed up in their finest and most colorful outfits. 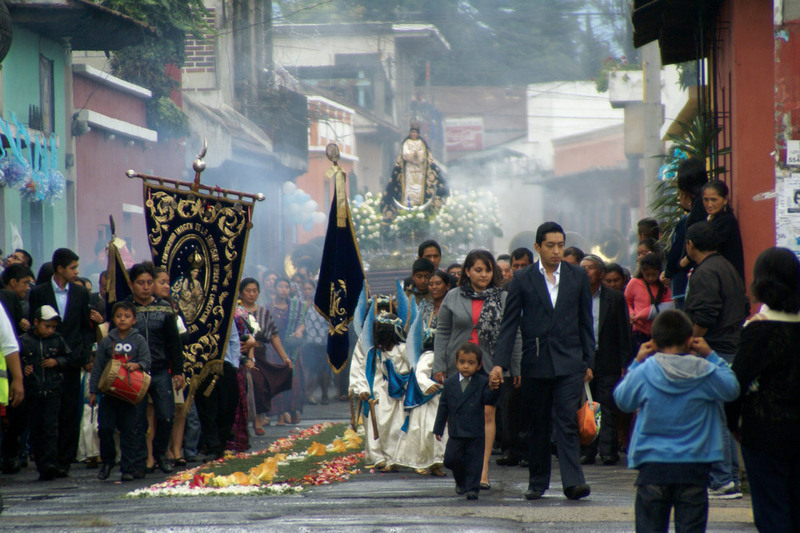 We were on our way to an annual procession honoring the Virgin of the Immaculate Conception, one of the oldest processions chronicled in the history of Guatemala, dating back more than 400 years. 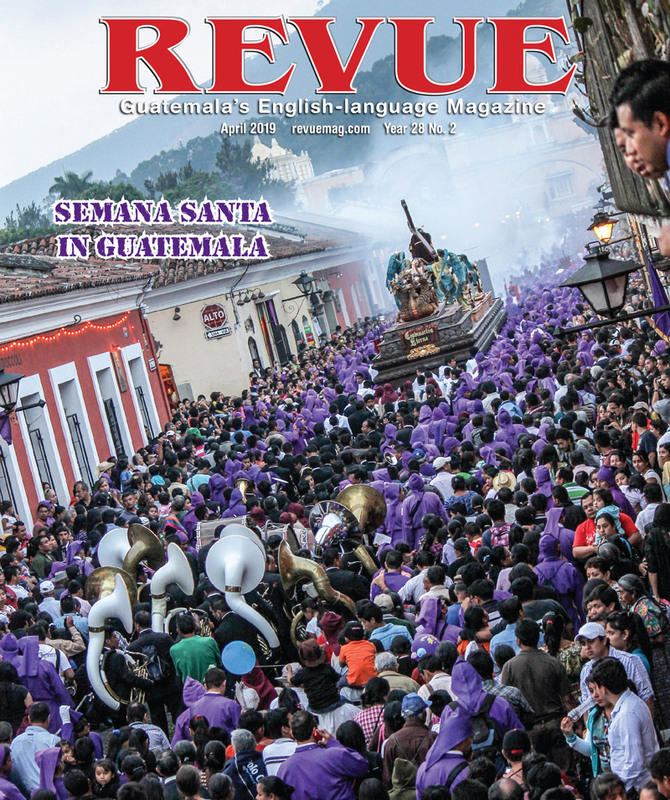 The Rezado — as the procession is known — comes on the heels of the burning of the devil — La quema del Diablo — when in cities throughout Guatemala, the devil is burned in effigy at the stroke of 6 p.m. on Dec. 7. Its purpose is to get rid of any bad spirits that might interfere with the celebration of the Christmas season, which officially begins with the rezado or Procession of the Virgin of the Immaculate Conception in which we were about to take part. Our filled-to-capacity chicken bus had just barely navigated a tight turn on a street near Ciudad Vieja’s huge central park. We jumped off in eager anticipation of what we were about to witness. I meandered a bit until I came upon La Conception Church where I stood awestruck in front of its impressive stucco façade. Unlike the solemn processions of Holy Week, the procession of the Virgin of the Immaculate Conception occurs in a more festive environment. There were carnival rides, enticing food stands, live music and dancing with creative costumes and colorful floats. The streets were bursting with activity as beautiful children dressed as cherubs and fairies boarded dozens of intricately decorated floats. 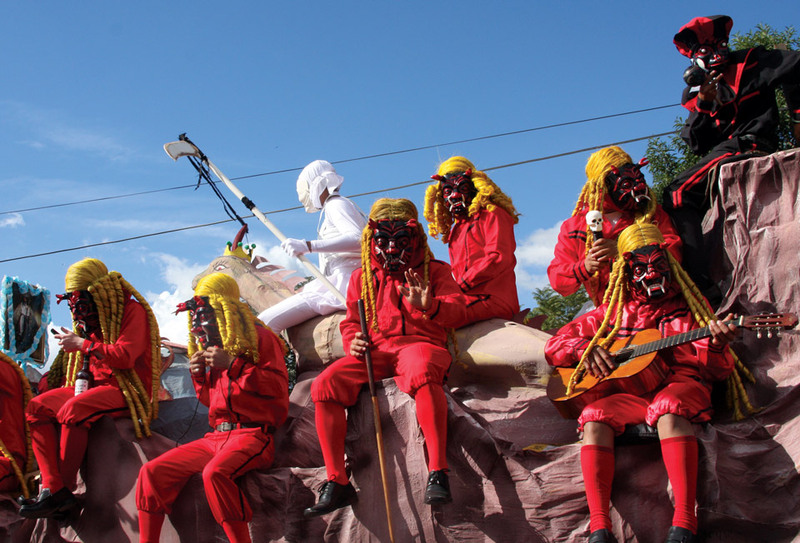 Some children were dressed up as red devils with blond wigs. Others danced in the streets, wearing hand-crafted masks made to look as if they were elderly. “La Chapetona is the nickname Guatemalans affectionately use to refer to Our Lady of the Immaculate Conception,” explained Ignacio Ochoa, director of the Nahual Foundation, a think tank by and for indigenous people of the Americas. Chapetona is essentially a reference to those who emigrated from Spain or Europe to Latin America during colonial times. 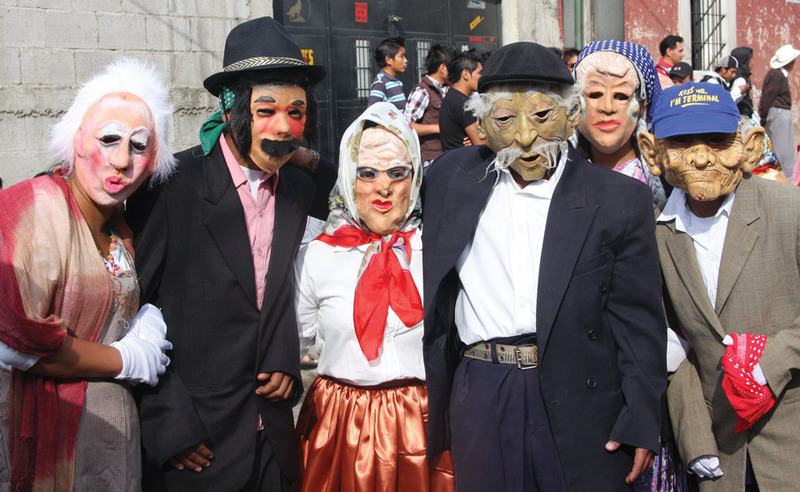 In 1527, the Spaniards founded their first capital of Guatemala in Ciudad Vieja, where they immediately became known as chapetones because of their distinctive accent. 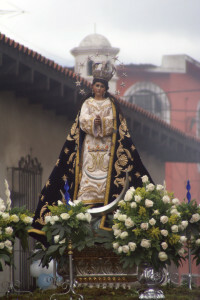 The revered statue of the Virgin of the Immaculate Conception, or “Image” as it is referred to by locals, was brought to Guatemala from Seville, Spain at the end of the 16th century by Franciscan Friar Antonio Tineo. 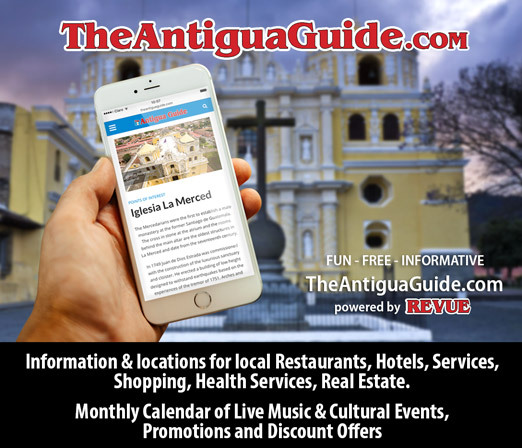 “It is a very beautiful statue that moved multitudes of believers to devote themselves to the Marian figure,” said Walter Ortiz, a longtime resident and chronicler for Ciudad Vieja. To this day, the original statue maintains a place of honor perched high above the altar in the town’s well-restored La Conception Church. For the Dec. 8 procession, a beautifully recreated replica of the original statue of the Virgin of the Immaculate Conception is placed on a float (anda). “Another sacred tradition,” explained Ortiz “is that this replica stays in the home of one of Ciudad Vieja’s residents for an entire year.” The Hermandad, a committee organized by the priest of the church to preside over religious activities, decides who will keep the replica each year. Residents must submit a letter to them explaining why they would like to have the replica in their home and the Hermandad has a drawing, choosing a letter at random. “As you can imagine, this is a great honor,” said Ortiz. “I remember when my grandmother took me to the procession,” recounts Mercedes Mejicanos, who has lived in Ciudad Vieja her entire life. “Now I take my own children, and I still feel a great sense of respect for the tradition and love for the Virgin,” she added.